The cleanup of Fukushima's leaking nuclear plant has been long, expensive, and plagued with problems. Now, the AP reports an auditor has found that more than a third of the budget for cleanup was wasted—totalling hundreds of millions of pounds. The previous allegations of incompetence and straight-up lies that surround Tokyo Electric Power Co, or TEPCO, the company responsible for the cleanup, might make you wonder if any of those millions were lost to corruption. But the Associated Press says that most of it was wasted because no one really knew how to clean up the site. The company spent millions on systems and machines that theoretically might have worked. But didn't. Let's start with what AP calls "the unfrozen trench," contaminated water leaks into these trenches—tunnels, really—that run alongside the plant, creating a major hazard. TEPCO started injecting the water with coolants in an attempt to freeze it, creating an ice wall of sorts as we reported. It didn't work. 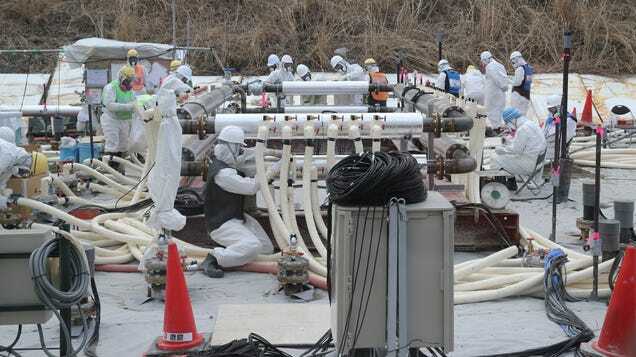 TEPCO says "it has proved exceptionally difficult" to freeze the trenches completely, according to World Nuclear News. "TEPCO subsidiary Tokyo Power Technology even threw in chunks of ice, but eventually had to pour in cement to seal the trench," says the AP. The project cost £566000, which is chump change compared to other items on the list. TEPCO workers install an underground frozen wall during a feasibility test. AP Photo/Koji Sasahara. Then there's Areva SA, a French company that promised its system would aid in Fukushima's cleanup. Problem is, its process has been sharply criticised back at home by the Nuclear Regulatory Commission, doctors, and environmental watchdogs. Areva adds metals and chemicals to the radioactive waste water used to cool reactors—these "bind" to the isotopes and pull them down. This sludge is removed and buried like traditional nuclear waste, while the water is recirculated—in the case of Areva's European plant, it's released right back into the English Channel. In 2011, Forbes reported that higher levels of Leukemia have resulted near the plant, and the contaminated water has even reached the Arctic. 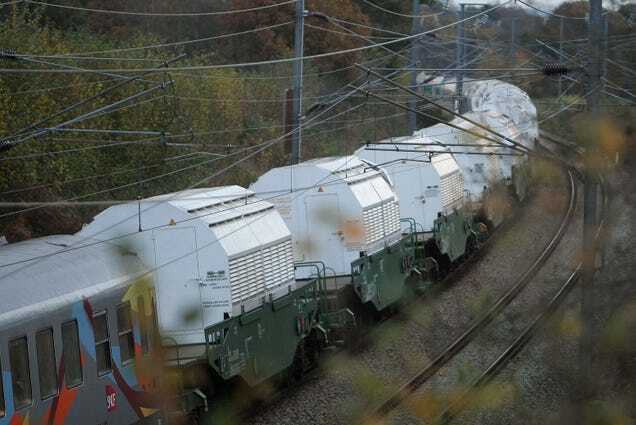 Containers of Areva-treated nuclear waste in France in 2011. AP Photo/David Vincent. Areva doesn't seem like the likeliest company you'd want to partner with—and indeed, the £182 million machine that was bought to treat Fukushima's water was abandoned after just a few months. Yetore money was wasted on the machines TEPCO bought to remove salt water from the contaminated water—the salt had been added when ocean water was used to cool the reactors just after the accident. "One of the machines functioned only five days, and the longest lasted just six weeks," says the AP. Two of the other big wastes on the list give us the best glimpse into the operation, since they show how the rapid pace and hurried process contributed to the budget overruns. The AP cites storage tanks for the water that cost £90 million that were "assembled by unskilled workers" and "began leaking and some water seeped into the ground and then into the ocean." Likewise, a series of underground pools for water storage "leaked within weeks." The audit paints a picture of a cleanup mired in problems that stemmed from untested cleanup technology—a situation made worse stemming as leaks continued to be discovered and remain unreported by Tepco, as we wrote last month. But beyond the company's involvement, it's an awful story—for Japan, for the people working on repairing the plant, and for the environment. Read the full AP report here. Lead image: The central control room of the No. 1 and No. 2 reactors. AP Photo/Koji Sasahara.